AP DEECET 2019 online application form, Dietcet apply online 2019 : This exam is organized by the Department of School Education Andhra Pradesh for providing admissions into 2 years D.Ed course. Through this exam students get admission into Govt Ded's and recognized private colleges in Andhra Pradesh State. The examination may be held on May 2019. AP DEECET 2019 Application Form has been opened for the candidates whose interested to join in D.Ed colleges . 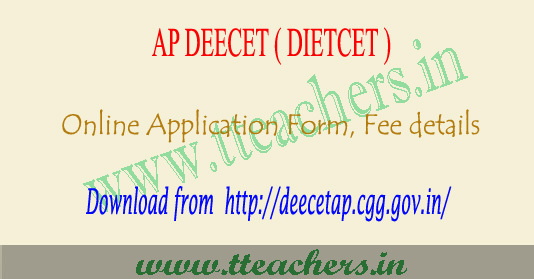 Here in this article, students can check the information regarding AP Deecet 2019 application form, dietcet apply online 2019. Fee and submission of Application Online : The fee prescribed for appearing for DEECET (including examination fee) is Rs500/- (Rupees Five Hundred Only).Candidates can pay the fee through payment Gateway between March 2019 to April 2019 and submit online application at the DEECET website http://deecetap.cgg.gov.in between March 2019 to April 2019. Procedure for submission of application online: Detailed procedure for applying ONLINE is given in the Information Bulletin. Candidates can download the “Information Bulletin” free of cost from the DEECET website http://deecetap.cgg.gov.in from March 2019 onwards. Candidates can submit their applications through online from March 2019 to April 2019.